Mario Tama/GettyThe humidity matters a lot less when you live in a big city. Humidity plays an important role in flu transmission, and flu spreads fastest when it’s cold and dry. 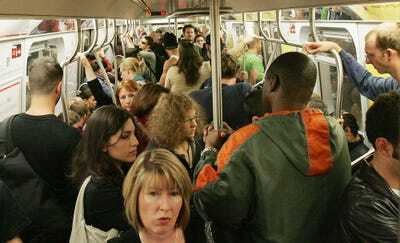 But researchers who studied flu rates in 603 metro areas around the US from 2002 to 2008 found that the viruses don’t circulate the same way everywhere. 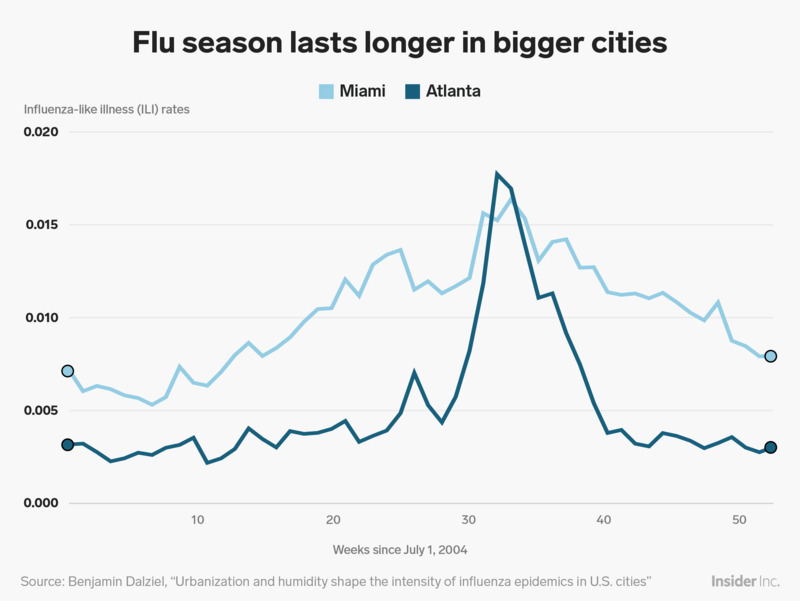 In large cities, flu season tends to last longer no matter the climate, suggesting that the weather doesn’t play as big a role in transmission rates as person-to-person contact. But peak flu outbreaks are more intense in smaller towns and suburbs. There’s a simple reason why the flu makes the rounds every winter: influenza viruses love cold, dry air. When the relative humidity drops, flu viruses linger in the air longer. Researchers aren’t sure yet why that’s the case, but it means more flu-bearing moisture droplets can travel from one person’s nose or mouth to another’s during the winter. That’s the finding of a new paper published Thursday in the journal Science. For the study, researchers looked at six years (2002-2008) of week-by-week flu illness data in 603 cities and towns around the US. They discovered that in more densely populated cities, flu season is typically longer and more persistent than it is in small towns. 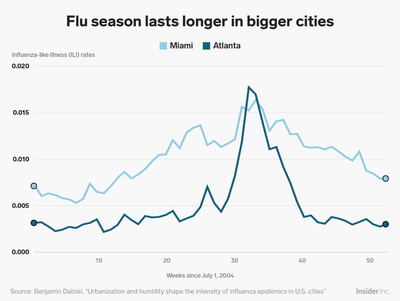 The researchers found that flu season lasts longer in more tightly packed cities like New York and Miami – despite their divergent climates – than in a city like Atlanta, where people’s homes and businesses are more spread out. The researchers don’t think that someone in a dense city is at a higher overall risk of catching the flu, but rather that they face a mild risk spread over many more weeks. “As cities get larger, more and more residential and workplace locations are focused within a few key spots within the city,” Dalziel said. 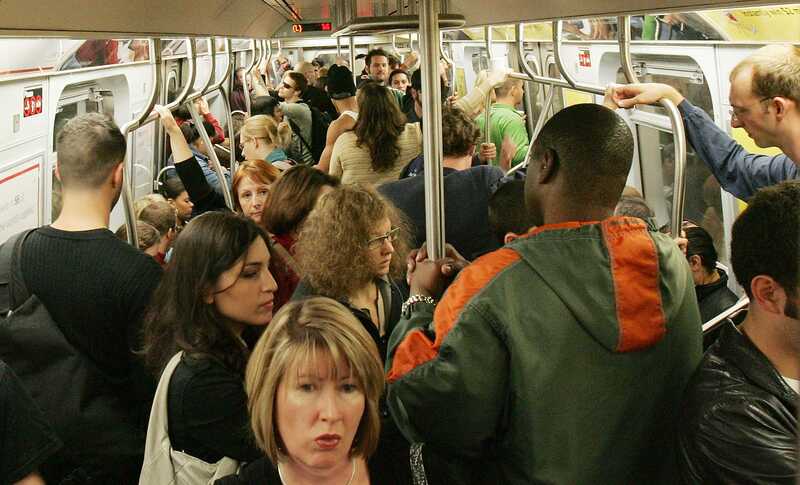 Those places – like crowded downtown areas where many people commute for work, for example – essentially become germ hubs, regardless of how cold it is. But this isn’t all good news for suburbanites. In more sprawling areas, according to the new data, flu transmission rates depend more on how cold and dry the air is than on people’s movements. So when a cold snap comes, more people get sick at the same time, which can put extra stress on the health care system and make it tough for hospitals to properly respond. “It’s remarkable to me that the sort of size and structure of the communities that we live in … in addition to all the other ways it shapes our lives, it’s also shaping flu epidemics,” Dalziel added. Researchers aren’t sure how severe this year’s flu season will be yet, but the 2017-2018 season was a doozy: flu viruses killed 80,000 people in the US, making it the deadliest season on record since 1977. This year, flu season in Australia was pretty mild, and the flu vaccine has been updated in the hopes of better protecting people against some of the most dangerous strains.